DIY Biology kits: what’s really growing inside? Munich, the Bavarian state capital, is the quintessential German town. From lederhosen to Oktoberfest, it’s filled with tradition and antiquity. It was here, however, that a curious group gathered to discuss one of the most revolutionary biological techniques of the 21st century: CRISPR-Cas, the latest tool for gene editing (see explainer: What is gene editing?). Its convenience and affordability make CRISPR-Cas particularly accessible, but who should be using it, and what for? For most attendees sitting in the sunlit seminar room, this was a topic for discussion. But at the close of that day’s meeting, a Bavarian government official asked one of the organisers to hand over the CRISPR-Cas kit sitting unopened at the front of the room. No explanation was given. CRISPR-Cas is already being used in research labs around the world. It allows biologists to cut strands of DNA in specific places to insert or delete particular genes (see infographic: How does CRISPR-Cas work?). 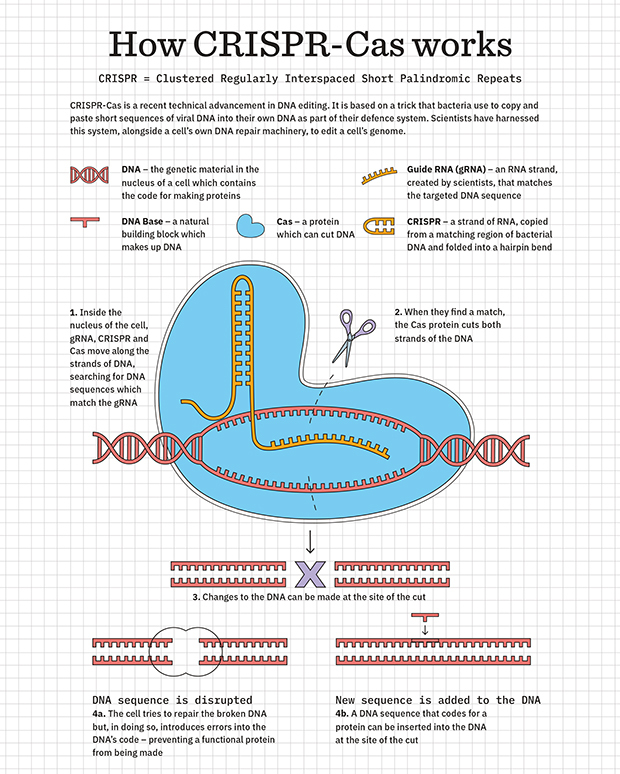 At EMBL, CRISPR-Cas is found almost everywhere, both in research and as an educational tool. It’s used to insert genes to fluorescently label and track proteins in zebrafish, or to delete genes in lab-grown brain cells to mimic neurodegenerative diseases, allowing scientists to study these conditions. EMBL is co-organising a CRISPR-Cas course in March 2019 which will teach scientists how best to use the technique, through theoretical and practical sessions. Researchers at EMBL Rome have visited a local school to introduce and discuss the concept and its implications to pupils. Genes are sections of DNA that usually act as code for building a specific protein within a cell. Different proteins might affect how a cell looks or functions, including its susceptibility to disease. Genes can be edited in the lab to change a cell’s characteristics. A gene can be deleted so that the protein it encodes won’t be made. Deleting a gene and studying how the cell or organism changes can give researchers an idea of what cell characteristics the deleted gene normally controls. Deleting a gene can also mimic a genetic disease, so that the disease and its potential treatments can be further researched. Alternatively, a gene that encodes a new protein can be inserted into the DNA, potentially altering the cell’s characteristics. In Germany, CRISPR-Cas technology is strictly limited to certified labs, but people’s curiosity extends much further. Those particularly interested in its application are members of the do-it-yourself biology (DIYbio) community, whose scientific backgrounds are as broad and varied as their aims. Their portrayal in the press has been mixed, with journalists alternately highlighting DIYbio’s potential dangers or educational possibilities. At the DIYbio space in Munich, one group of enthusiastic undergraduate students have set their sights on the International Genetically Engineered Machine (iGEM) science competition. Others are more interested in improving the taste of their homemade kombucha – a type of fermented tea – by creating automated monitoring systems. Whatever their interests, these groups share a common curiosity and fascination with biology. The event took a new turn, however, when the LGL asked – without explanation – for the DIY CRISPR-Cas kit to be handed over. Trojok and other DIY biologists were keen to know what was going on. “The government didn’t want to discuss why they took away the kit,” says Trojok. “We didn’t know why they were acting so strangely.” A week later, a leaked government document surfaced, revealing that several potentially pathogenic bacteria had been discovered in three independently obtained kits. This was closely followed by an official press release from the LGL, but Trojok was still unable to discuss the situation with government officials. 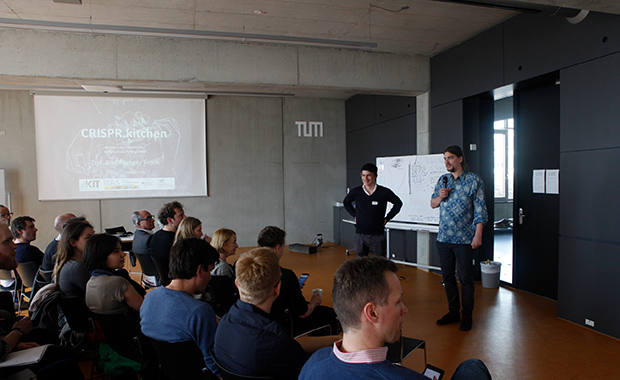 “I asked the Bavarian agency to reveal the original data, but they refused,” says Trojok. “If they had really found contamination, we didn’t know why they wouldn’t share this information.” Trojok contacted the company who manufactured the kits, asking them to run their own tests. These came back clean, showing only a safe strain of E. coli bacterium, which was listed as part of the kits. Clarification was sorely needed, so the DIY biologists approached Vladimir Benes, head of the Genomics Core Facility (GeneCore) at EMBL’s Heidelberg site. “EMBL is independent of the company that produced the kit, the DIY biologists who want to use it, and the government that banned it. We just want to know the facts,” explains Benes. This independence stems from one of EMBL’s founding goals: to be a supranational research centre that is independent of the changing priorities of national governments. “It was an opportunity for GeneCore to provide a service to one of its member states and manage a conflict by being a neutral party,” Benes continues. From the information that Trojok had gleaned, Benes knew that different identification tests had been used by the LGL and the company involved. Researchers at the LGL tested the identity of the bacterial species using a technique known as MALDI/TOF analysis. This uses mass spectrometry to identify which bacterial molecules are present and then compares them against a known set of bacterial profiles. Meanwhile the company used a method known as 16S sequencing, in which a specific DNA region in the bacterial cells is sequenced and compared against public databanks. Both analyses are routinely used in professional research labs to identify bacterial species, but each method has its limitations. At GeneCore, whole-genome sequencing is the norm. This method – in which all the bacterial DNA is amplified, sequenced and compared against the genome that the researchers expect it to be – is currently the gold standard in DNA sequencing. According to Benes, this method is the most robust form of analysis to find out what’s really in a sample. 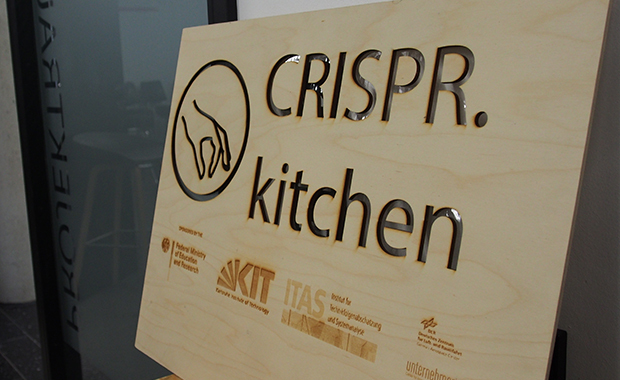 Aided by government agencies in Berlin – with whom Trojok has a close working relationship – the DIY biologists provided EMBL with three of the same DIY CRISPR-Cas kits, bought before the CRISPR.kitchen event. 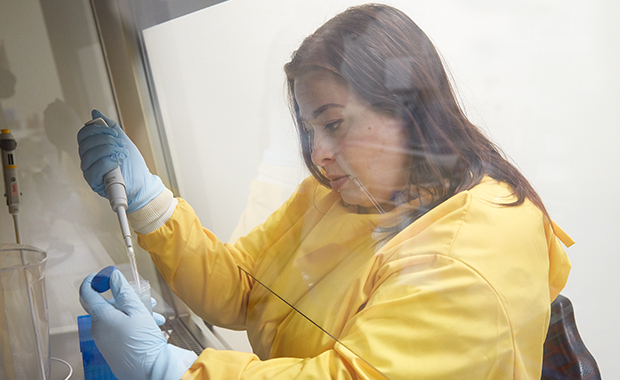 Alongside Benes, GeneCore team members Anja Telzerow and Jonathan Landry set to work: Telzerow in the lab – taking all necessary precautions for working with an unknown substance – and Landry at the computer, meticulously analysing the DNA sequences. Bacterial colonies could be grown from only one of the kits, so it was these that were sequenced and compared with a known E. coli genome at GeneCore. Only 30% of the DNA fragments from the kit matched the E. coli genome – an unexpected result for a kit supposed to contain only E. coli. Yet the exact bacterial species present were difficult to pin down, as large portions of the DNA sequences matched four other bacterial species. Tellingly, three of those were species within the Enterobacter genus, a type of bacterium which was also identified by the LGL. But Benes had to be sure of the result – it was vital to confirm the findings with another test. Therefore, the bacterial DNA sequence in question was compared with a subspecies of Enterobacter, profiled in one of GeneCore’s databases. This gave an 83% match, indicating that the bacterium present in the kit was likely a species of Enterobacter. “Without Anja and Jonathan’s skills and tenacity, we wouldn’t have been able to get the right answers,” says Benes. A risk assessment of the kit by the European Centre for Disease Prevention and Control deemed the risk of infection as ‘low’, and no one was thought to have been harmed as a consequence of this contamination. But some species of Enterobacter are known to cause opportunistic infections in ill people or hospitalised patients.